The TP-104 series of color-coded PCB-mountable loop-style test points are designed for use with 0.062-in.-thick boards (see the Figure). The RoHS-compliant components from Components Corp. feature plastic standoffs that permit quick and straightforward identification and allow easy polarization. The plastic bases are UL 94V-0 rated and come in 10 colors. The test points are made of 0.015- by 0.030-in. phosphor bronze #510 alloy and a 100% matte tin (0.0001 min.) over nickel (0.00005) underplate. The collar is 15% glass-filled polyester. The low-profile test points are designed to facilitate a secure, non-slip grip for alligator clips, probes, J-hooks, tips, and grabbers. The TP-104 series can be ordered precut to any of 30 positions and come on breakaway strips with 0.125-in. centers for convenient storage and handling. The devices are easy to install individually or in tandem, using the company's distinctive hand tool (p/n 1040). The tool separates, grips, and positions the test points in one motion. To protect the integrity of tandem installations, the parts feature a rectangular passage in their molded standoff to maintain wire form alignment. 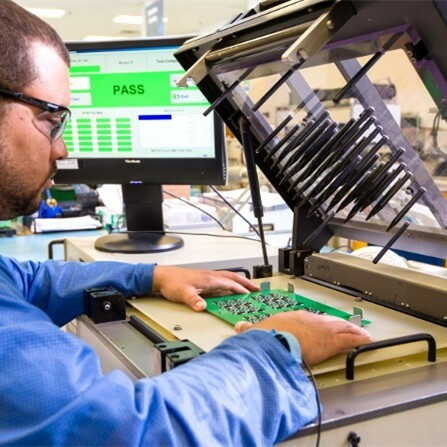 Once accurately positioned on the board, the terminals will remain securely in place during and after the wave soldering process. The TP-104 series of color-coded PCB-mountable test points is available from stock to four weeks. The TP-104 test points cost $0.092 each in quantities of 1000. Samples are available on request.